in front of your eye; the retina of your eye corresponds to the screen. 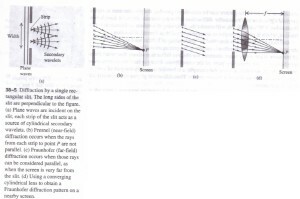 Figure 38-5 shows a side view of the same setup; the long sides of the slit are perpendicular to the figure, and plane waves are incident on the slit from the left. 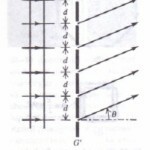 According to Huygens’ principle, each element of area of the slit opening can be considered as a source of secondary waves. In particular, imagine dividing the slit into several narrow strips of equal width, parallel to the long edges and perpendicular to the page in Fig. 38-5a. Cylindrical secondary wavelets, shown in cross section, spread out from each strip. 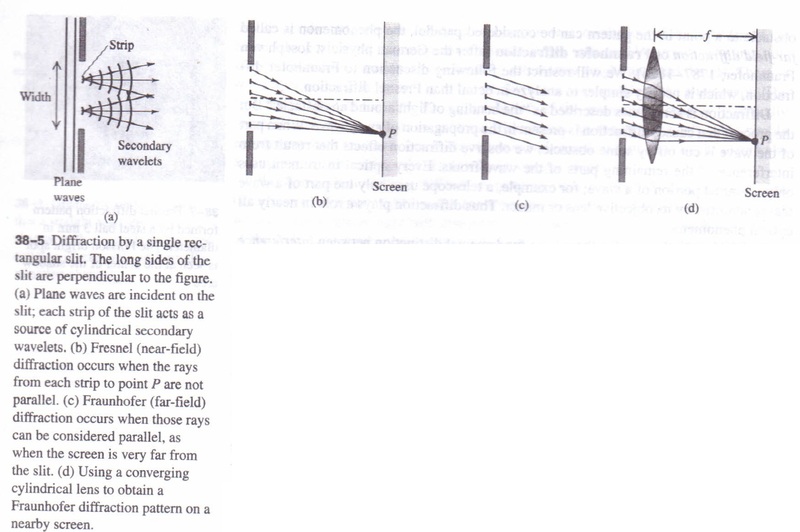 lens forms a reduced image of the same pattern that would be formed on an infinitely distant screen without the lens. We might expect that the various light paths through the lens would introduce additional phase shifts, but in fact it can be shown that all the paths have equal phase shifts, so this is not a problem. The situation of Fig. 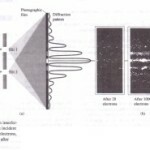 38-5b is Fresnel diffraction; those in Figs. 38-5c and 38-5d, where the outgoing rays are considered parallel, are Fraudster diffraction. We can derive quite simply the most important characteristics of the Fraudster diffraction pattern from a single slit. First consider two narrow strips, one just below the top edge of the drawing of the slit and one at its center, shown in end view in Fig. 38-6. The difference in path length to point P is (aI2) sin 8, where a is the slit width and 8 is the angle between the perpendicular to the slit and a line from the center of the slit to P. Suppose this path difference happens to be equal to ).12; then light from these two strips arrives at point P with a half-cycle phase difference, and cancellation occurs. Similarly Iight from two strips immediately below the two in the figure also arrives P a half-cycle out of phase. In fact, the light from every strip in the top half of the slit els out the light from a corresponding strip in the bottom half. The result is complete cancellation at P for the combined light from the entire slit, giving a dark fringe in the interference pattern. That is, a dark fringe occurs whenever . The plus-or-minus (±) sign in Eq. (38-1) says that there are symmetrical dark fringes above and below point a in Fig. 38-6a. The upper fringe (8) 0) occurs at a point P where light from the bottom half of the slit travels ).J2 farther to P than does light from the top half; the lower fringe (9 < 0) occurs where light from the top half travels ).J2 farther than light from the bottom half. We may also divide the screen into quarters, sixths, and so on, and use the above argument to show that a dark fringe occurs whenever sin 8 ‘” ±2A/a, BA/a, and so on. Thus the condition for a dark fringe is For example, if the slit width is equal to ten wavelengths (a = lOA), dark fringes occur at sin 9 Between the dark fringes are bright fringes. We also note that sin 9 = 0 corresponds to a bright band; in this case, light from the entire slit arrives at P in phase. Thus it would be wrong to put m = 0 in Eq. (38-2). The central bright fringe is wider than the other bright fringes, as Fig. 38-4 shows. In the small-angle approximation that we will use below, it is exactly twice as wide. With light, the wavelength A is of the order of 500 nm = 5 x 10-7 rn. This is often much smaller than the slit width a; a typical slit width is 10-2 em = 10-4 rn. Therefore the values of 9 in Eq, (38-2) are often so small that the approximation sin 9′” 9 (where 9 is in radiant) is a very good one. In that case we can rewrite this equation as. This equation has the same form- as the equation for the two-slit pattern, Eq. (37-6), except that in Eq. (38-3) we use x rather than R for the distance to the screen. But Eq. (38-3) gives the positions of the dark fringes in a single-slit pattern rather than the bright fringes in a double-slit pattern. Also, m = 0 is not a dark fringe. Be careful!